Brief Synopsis – A former tobacco industry chemist breaks the story to the media as to what the Cigarette companies really know and are hiding from the public regarding the dangers of smoking. My Take on it – I have always loved this movie ever since I saw it in the theater 16 years ago. 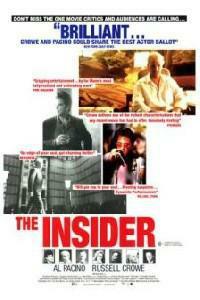 The performances by Al Pacino and Russell Crowe are both brilliant. Pacino is always great, but this was one of Crowe’s first opportunities after LA Confidential (1997) to prove his talent is no fluke. I actually believe that this was his best performance as an actor and that part of the reason that he won the Best Actor Oscar the following year was because of his nominated performance here that couldn’t beat Kevin Spacey’s work that year. I was reminded of how much I loved this movie after recently seeing Truth (2015) which deals with some very similar circumstances and foibles in CBS history. The message of this movie about journalistic integrity and responsibility is very clear; the public needs to believe that they are getting the truth from the news reports. The story is very gripping and if you look at the newspaper any day, you can see that not much has changed since this event happened 20 years ago. I loved the way that we could feel Crowe’s anxiety as he struggled with his own conscience that could potentially bring harm to his family, his career and also his life. Bottom Line – Excellent portrayal of a man trying to show his convictions, but still fearing for the safety of his family, career and ultimately his life. Really follows the message about journalistic responsibility and trust to the public. Pacino is great here, but Crowe is even better; perhaps even his best role ever. Very gripping and unfrtunately still very relevant even 20 years after the real story happened. Highly Recommended!